We are super excited to bring you more awesome features that we developed for you this summer. These will help you boost your engagement, get more loyal followers, and work more efficiently with your social media team and clients. If you are boosting an existing post, then go to your Facebook feed and select the post that you want to boost. We accept any currency and allow you to customize your audience as much as you like. For more information on our Facebook boost feature check out this detailed post. You are now able to post multiple images on Facebook, here is what this looks like. Choose your Facebook profile (works for pages and groups as well) and attach each image individually. The preview will show all the images together in one post – that’s how you know that it will display it for you as a Facebook gallery or carousel. And voila! You got yourself a Facebook Gallery, enjoy! We have added a new report that shows the data for multiple channels at once. Simply select any Facebook, Twitter, LinkedIn, Instagram and Youtube channels together, and you will get one report for all of them. Another great feature is that you can now select multiple profiles from the same social media network and put them in one report. First, select the Cross Channel Report option in your analytics tab. Next, select the Twitter profiles that you want to view for example, and click Ok.
You can do that for any social network. Agencies can now export selected posts to a pdf file, with the brand’s logo, and send that file to their client for approval. This is our first step towards a full blown post approval system, so stay tuned for more functionality in this feature! We’ve made it so much easier to view and reorder your queue posts, you won’t even believe it. First of all, you can now sort the list of posts by either creation date or by the time the post was published. This allows you to easily find oldest posts that you have in your queue if you need to remove or update them. Also, you can now re-order your posts easier. Each post now has a position in the queue, and you can simply put a different number in there to change its position. Also, when you click on bulk actions you have the option to shuffle your posts – that will put them in random positions in your queue. Our new feature allows you to track all of your audience’s reactions to your advertisement on Facebook – you can see it’s performance, reach, # of clicks, # of reactions, likes, comments, and shares. You can now see reviews of your business in the Social Inbox. And when people leave comments to the review, you can see those as well! This gives you full visibility and flexibility of every Facebook interaction. Again, our sincere thanks to our dedicated customers that gave us a lot of suggestions, feedback, and encouragement along the way. 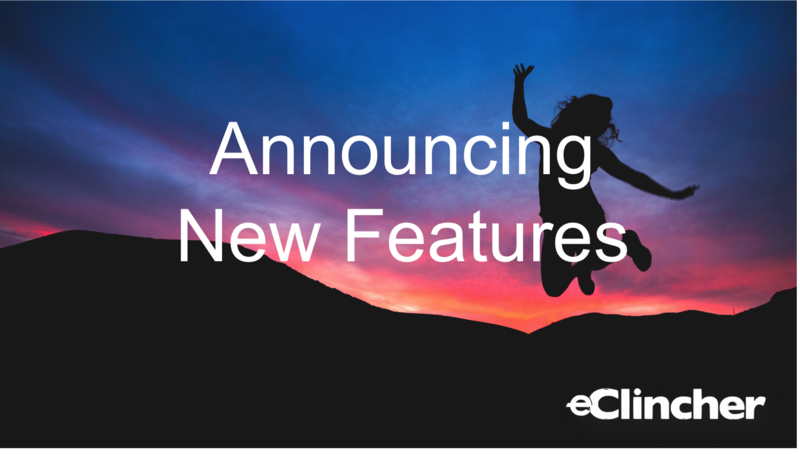 We hope you enjoy using these features, and let us know of any new ideas you have of how we could improve eClincher features for you.